Chaos ruled the streets of Baltimore, Maryland on Monday night, April 27th, 2015. Violent protests broke out after the funeral for Freddie Gray, who died under mysterious circumstances, of a severe spinal cord injury while in police custody. In the ensuing riots, there were over 200 arrests, 144 vehicle fires and 15 structure fires in what has been popularly called Baltimore’s Purge. Modern media pounced upon the term "purge" as it was widely reported by the national press that rioting at a Baltimore shopping mall and elsewhere on Monday afternoon, started amid rumors… spread on social media… of a "purge" initiated by large groups of “wilding” high school students. As many of you know, use of the word "purge" is a reference to 2013's "The Purge" and its sequel, last year's "The Purge: Anarchy"
The Baltimore Sun reported that a flier, circulating amongst students via social media, touted a "purge" scheduled to begin Monday at 3 p.m. at the Mondawmin Mall …and then proceed downtown. The flier included an image of protesters smashing the windshield of a Baltimore City police car, from Saturday’s protests. On Saturday, over 2,000 protesters marched to Baltimore's City Hall to condemn the death of 25-year-old black man Freddie Gray. Gray was pronounced dead on April 19, after suffering a spinal injury while in Baltimore Police Department custody a week earlier. The Purge SCI FI series plotline revolves around a dystopian future America where on one day each year… all laws are suspended for a 12-hour period. During that time, all crimes, including murder, become temporarily legal. The "New Founding Fathers of America" have come to power following an economic collapse and have instituted totalitarian rule. In their wisdom, they have also established a one night a year “Purge” sacrificial ritual. All crime is legal and all police, fire and medical emergency services remain unavailable for 12 hours… from 7 pm till 7 am the next day. The New Founding Fathers market this sanctioned mayhem as a catharsis… a purification ritual that has resulted in both crime and unemployment rates plummeting to 1%. The Purge has consequently contributed to a strong American economy, as reported to an unsuspecting population. Although it is thought to be used as an act of cathartic cleansing for the populace, in reality, it is used as a method of artificial population control. The new U.S. underclass… people living in poor areas… people who have fallen out of the old middle class and into poverty… are the main targets, as they cannot afford protection or insulation from the ensuing violence. Obviously, this plotline has deeply troubling similarities to real life Baltimore. Coincidentally, the movie Purge takes place on March 21, 2022… within 2 calendar days of the death of Gray and subsequent outbreak of the Baltimore rioting. Such spooky similarity takes on significant import, as the very nature of synchronicity can be defined as: meaningful coincidence. These connections are the proverbial “cosmic triggers” that act as warning signs to those who pay attention to such things. The Baltimore State’s Attorney, Marilyn Mosby… standing alone in front of the mass media, without support of the Mayor or the Governor… announced the criminal charges against the six police officers involved in Gray’s wrongful death. This action has significantly raised the stakes in acts of civil disobedience, across America. Mosby represents an expectation of justice for the disenfranchised and the dispossessed. Mosby puts a face to the outrage over the militarization of police, the erosion of civil liberty and the perceived targeting of black youth. The situation in Baltimore also sheds light on the wider issue of incarceration rates in America. As you all know, the United States has the world’s highest incarceration rate. About 2.4 million people live behind bars in America… the highest number in the world. That's a little more than 0.7% of the population and more than 700 for every 100,000 people. Ethnically, Blacks in America are imprisoned 5 times more often than Whites and twice more often than Latinos. The erosion of civil liberties in the United States of “Amerika” is as horrific as any plot from DC Comics or the Purge films. Our loss of liberty is as profound as any dark knight fantasy or any Sci Fi dystopia. Things are about as bad as it gets… and apparently getting worse. Our beloved “land of the free” Ain’t so free… ya gotta pay to play. That why the kids of Baltimore were burning and looting… they can’t afford Nike shoes, any more than they can afford justice. 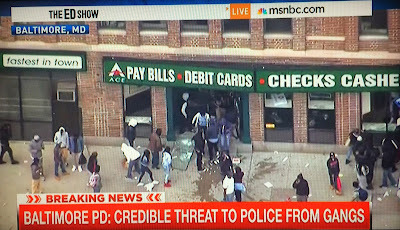 In a way, the most symbolic video clip from Baltimore was the burning and looting of the local ACE Cash Express… one of the most notorious payday lenders in the country. Payday lending is one of the most despicable and predatory examples of Amerika’s decent into dystopia. It is a most vile capitalist ploy, designed to keep the new Amerikan underclass “beneath the boot” of the new ruling class. 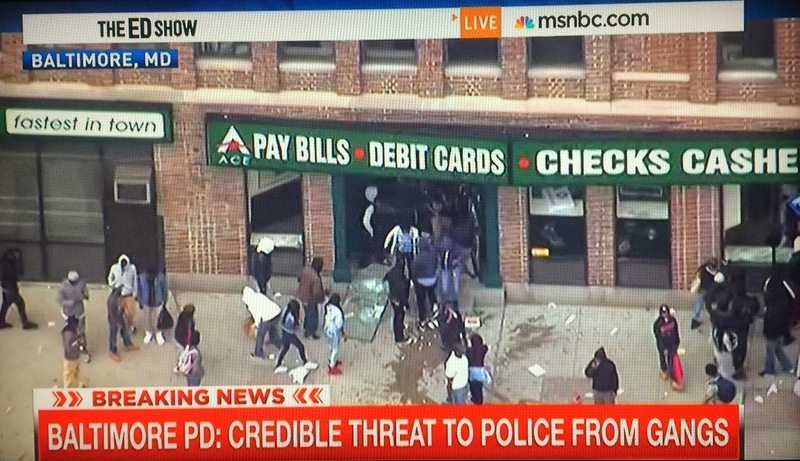 There is an undeniable “poetic justice” in the ransacking of ACE Cash Express. Any business that profits from the unjust propagation of poverty and indebtedness… entrapping Amerika’s poor… needs to be exposed for what it is… modern slavery. 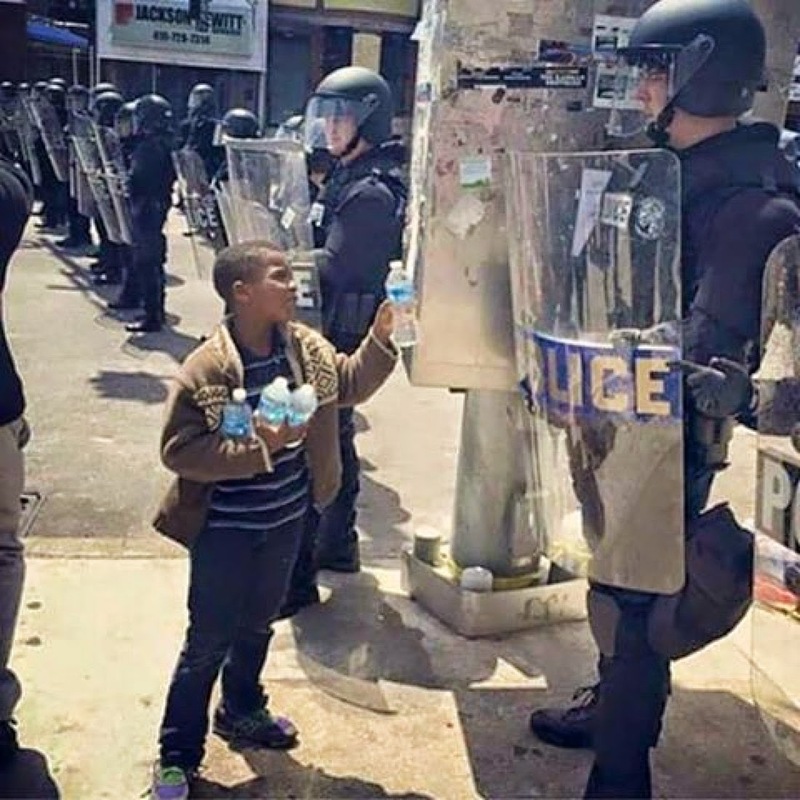 No this is not an endorsement for violence… but the rioting kids in Baltimore know the score. We use the term Amerika, to contrast what we are experiencing today, versus the old “land of the free” America. In modern Amerika, there is no American Dream. The opportunity for our kids to be better off than we were… is slipping away. Remember… our kids are not just those we gave birth to… those we love, protect and do our best to set an example for. Our kids also live in Baltimore. 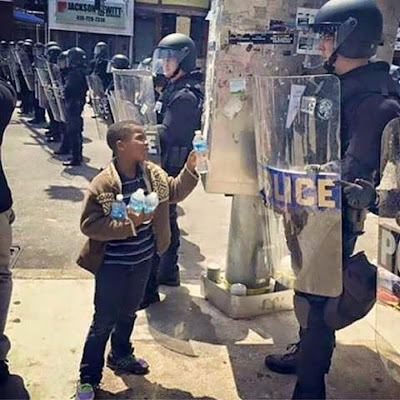 Our kids also live in Ferguson. In the meantime… the symbolic and synchronistic warning signs continue to present themselves in modern media. Technologies such as the video functionality of smart phones, allow for “citizen journalists” to expose otherwise un-recorded and un-reported atrocity. These citizen reporters will make sure that “events on the ground” will be published in modern social media… perhaps our last/best opportunity to strike back against the evil empire. Stay alert… watch the signs… constant vigilance!